A recent article in Bloomberg (link below) pointed out that the hedge fund industry posted its worst month in September since at least 2000. 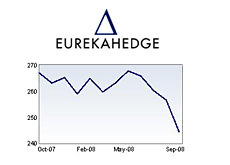 The article pointed to the Eurekahedge Hedge Fund Index as evidence for the substantial drop. The index, which tracks over 2400 hedge funds, posted a 4.75% decline in September, based on preliminary figures. It should be noted that the Eurekahedge Hedge Fund Index started collecting data in 2000, so it's hard to say exactly when the hedge fund industry posted a month as bad as September of 2008. I'm guessing that the summer of 1998 (LTCM crisis, Russia defaulted on their bonds) may have been the last time that the hedge fund industry suffered this kind of a single month loss. Anyways, the article also points out that the index is down 7.9% for the year (through September), and that the index is on track for its worst ever single year performance. The reasons for the decline in the hedge fund industry aren't hard to figure out. Many clients are simply choosing to pull their investments from the hedge fund industry, opting to sit on cash instead of leaving it in the hands of a hedge fund manager. This has forced many hedge fund managers to liquidate positions to meet these redemptions, and they have been forced to take losses as a result. The decline of the global stock markets and the credit contagion have also contributed to the horrible month for hedge funds. Many top funds have taken a beating over the past few months as their stock and bond investments have tumbled. Citadel Investment and SAC Capital Partners are two well-known casualities of the decline in the stock market. The temporary ban on the short-selling of certain securities certainly didn't help the industry either. According to the article, the hedge fund industry lost about $90 billion in total assets in September. This leaves the industry with approximately $1.8 trillion in total assets, still well up from the $490 billion that it began the decade with. Hedge funds that invested primarily in the European market led the drop in September, as they shed an estimated 6.9% in value. This was followed by funds that invest in emerging markets (-6.8%), North America (-5.3%) and Asia (-4.8%). All in all, a terrible month for hedge funds, but not unexpected.